M1 mount with telescope. Illustration courtesy of Stellarvue. 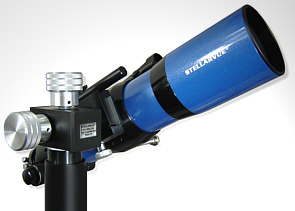 Stellarvue's alt-azimuth (AZ) mounts are among the best on the market. They have acquired a fine reputation for stability and quickly damping unwanted vibrations. 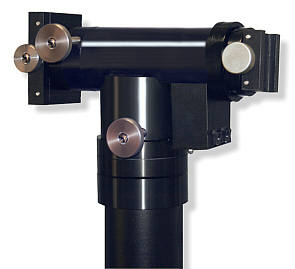 Stellarvue offers three alt-azimuth mounts in their current line. These mount heads are available with tripods to match and are intended for use with Stellarvue refractor telescopes of various sizes. Of course, these mounts can be used with other brand telescopes of similar size and weight. The MG mount, for example, is very appropriate for the Celestron Omni XLT 102 and 102ED telescopes. Telescopes are typically attached to these Stellarvue mounts by means of a Vixen dovetail rail, with Losmandy mounting plates an optional alternative. Beginners, as well as advanced amateur astronomers, find the up/down and right/left movements of AZ mounts easy to aim for a quick look at both celestial and terrestrial objects. Even if you already own a high quality equatorial mount for your astronomical telescope, a high quality AZ mount is a worthwhile alternative and these Stellarvue alt-azimuth mounts are among the best. The smallest mount head is the M1, intended for use with the carbon fiber Raptor 90mm and all Stellarvue 70mm-80mm clear aperture refractors. These telescopes weigh up to about six pounds. The M1 is a simple, friction type AZ mount head, but entirely suitable for these short tube refractors and catadioptric (CAT) optical tubes of similar clear aperture and weight. The M1 head is most commonly found combined with the MECA column on the Stellarvue stainless Grab and Go 8.6 pound tripod, which uses a 5/8"-11 mounting bolt. However, it can be attached directly to heavy-duty photo tripods that use a 3/8"-16 mounting stud and incorporate a center extension column, such as Bogen and Gitzo tripods. For users wanting a heavier tripod than the Grab and Go, the M1/MECA combination can be mounted on the 11.2 pound Stellarvue Heavy Duty Aluminum Surveyor's Tripod, which uses the same 5/8"-11 mounting bolt size as the Grab and Go tripod. Left to right: M1 head, Grab and Go Tripod, M1 w/MECA and handle. Illustrations courtesy of Stellarvue. The M1 moves smoothly on 2" diameter Teflon bearing surfaces. It has tension control knobs for both the altitude and azimuth movements. You set the amount of resistance to whatever level is appropriate for your needs and manually slew the telescope to aim it at a desired object. Stellarvue offers a 5/8" diameter accessory mount handle with a foam grip if you prefer not to push on your telescope to aim it. We find the handle a more natural way to aim the mount. Astronomy and Photography Senior Editor Gordon Landers uses an M1 mounting system under his 70mm, 80mm and Raptor 90mm refractors and considers this to be the ultimate "quick look" set-up. The 2009 MSRP of the standard M1 head is $199, plus $49 for the MECA column and $149 for a Grab and Go tripod or a Heavy Duty Aluminum Surveyor's Tripod ($397 complete). The optional mount handle is $25. The middle size Stellarvue mount is the MG. It is intended for use with refractors up to and including 115mm (4.5") clear aperture and weighing about 15 pounds, such as the Stellarvue SV115T and SV115EDT. It also works great with similar size catadioptric optical tubes. The MG is a more refined replacement for the earlier, and well regarded, M3 mount head. 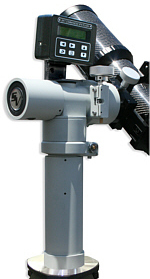 The MGE mount head is simply an MG with built-in digital encoders that is ready for use with the Sky Commander digital setting circle computer. This mount is basically a medium size German equatorial mount head without a counter weight bar or latitude adjustment that has been stood on its tail (pointing straight up) and attached to a short pier to provide clearance between the telescope and the mount's supporting tripod. What would ordinarily be the RA axis thus becomes the azimuth (right/left) axis and the declination axis becomes the altitude (up/down) axis. This adaptation keeps the center of gravity of the mounted telescope close to the axis of the mounting pier. To use, move the mount manually to point the telescope at an object and use the slow motion controls for fine aiming adjustments or to follow the object's motion across the night sky. Stellarvue claims that the MG is more stable than a single arm fork (often used to mount short tube refractors) and dampens vibrations faster. It also dampens vibrations much faster than the lightweight M1 mount. Left to right: MG, Heavy Duty Surveyor's Tripod, MGE w/optional Sky Commander. Illustrations courtesy of Stellarvue. The MG and MGE come with Stellarvue's 11.2 pound Heavy Duty Surveyor's Tripod, which uses simple (and somewhat awkward) screw knobs to secure the leg extensions. The height can be varied from 38"-64.2" to the top of the tripod (not including head). Folded, the tripod measures 42" long and about 6" in diameter. The supplied carrying strap also serves to bind the legs closed for transportation. Cast aluminum spikes are fitted to the ends of the legs (no rubber feet). 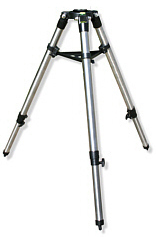 If you don't like aluminum tripods (we do, because they do not warp and stick like wooden tripods) similar surveyor's type tripods made from alder wood (11 pounds) or maple wood (13 pounds) are available options. 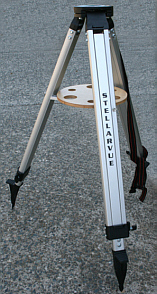 The Stellarvue tripods use an Appleply tray to set and secure the leg spread. This laminated wood tray comes with three 2" diameter and three 1.25" diameter holes for eyepieces. There is plenty of space for additional eyepiece holes and Astronomy and Photography Owner and Managing Editor Chuck Hawks used a hole saw to add three more 1.25" cut-outs to his Appleply tray, with space remaining for more holes should they be required. Chuck uses an MG with his SV115T telescope and Gordon uses his earlier M3 with his 4" SV102ED and SVR105-3 Raptor scopes. We can attest to the fact that these are capable AZ mounts with very short damping times. The MG is a pleasure to use and a bargain at its 2009 MSRP of $499 complete with tripod (add $300 for the MGE). The largest of the Stellarvue AZ mounts is built around the 14 pound M7. 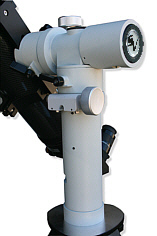 It is a very beefy mount head with a 35 pound load capacity designed for use with Stellarvue 130mm and larger refractors or other telescopes of similar size and weight. The M7 is a "T" shaped double head with attachments for telescopes at both ends of the T's crossbar. A typical set-up would be a 5" SV130T on one side of the M7 and a 2.75" SV70ED serving as a finder scope on the other side of the mount. Gordon uses this array on his M7. If the mount is to be used with a single heavy telescope, an accessory counter weight shaft and weight can be fitted to the opposite side of the mount. A counter weight is only necessary when using a large telescope, however; most solo scopes will not need to be counterweighted. M7 mount head with quick release telescolpe mounting shoes. The M7 is advertised as a substantial improvement over the other Stellarvue AZ mounts in load capacity, rigidity and damping time. Stellarvue claims that, "The ergonomics, bearings, load capacity and smoothness of the M7 is unsurpassed." It features improved locking ability in azimuth and altitude and can easily adapt to changing loads and handling different size telescopes in dual scope configurations. The M7 has 5" diameter azimuth bearing surface with Teflon and stainless roller bearings on both axis. The two attachment arms are provided with �"-20 attachment holes spaced 1.5" apart. Add the TD2, TD3 or TD7 spring loaded quick release shoes that accept Vixen or Losmandy dovetail rails for convenient telescope mounting. M7 head with encoders on TSL6 pier/tripod. 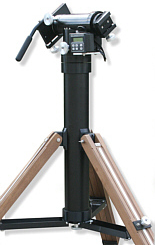 The M7 is designed to be supported in the field on the TSL6 pier/tripod. This monster is an aluminum portable pier 10" tall and 4" in diameter that is elevated by short, adjustable, solid walnut legs. Three folding aluminum channel struts set the leg spread. These attach to the bottom of the pier by means of a single knob and are removed for transportation. There is a 3/8"-16 attachment bolt at the top of the pier for direct attachment of an M7 mount head, but other bolt sizes can be specified. 3/8"-16 is a common tripod attachment stud and many professional photo tripod heads, such as Bogen and Gitzo, are designed for this size mounting bolt. The TSL6 weighs-in at 27 pounds and stands between 38.5" and 50" tall to the top of its pier. It is an exceptionally stable and solid mount with practically zero damping time that is suitable for use with all Stellarvue telescopes, as well as large CAT's, such as the Celestron C8, C9.25 and C11. The basic M7 mount head carries a 2009 MSRP of $895; add $300 for built-in encoders. TD2 (Vixen, $79) and/or TD7 (Losmandy, $99) spring loaded quick release shoes are extra cost options. The TSL6 Pier Tripod base for the M7 is $695. 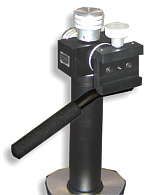 The optional counter weight shaft and adapter are $49 and a 12 pound, machined steel counterweight costs $99. Copyright 2009, 2013 by chuckhawks.com. All rights reserved.